Founded in 1989 as one of the country’s first direct car insurance companies, Churchill – part of the Direct Line Group – has expanded to offer a range of insurance products, including home insurance, travel insurance, pet insurance and breakdown cover. Get an online quote for Churchill car insurance. 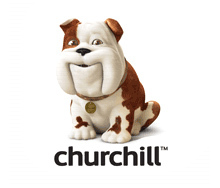 Churchill is known for its advertising mascot, the nodding dog, and has won a host of insurance and customer service awards. You can get a quote from Churchill's car insurance website. Churchill is one of our top 10 top car insurance companies, find out where it came here. Churchill offers two levels of cover for new customers: comprehensive and third-party fire and theft. Comprehensive cover is the most extensive option and covers you for most damage done to your own car, as well as a third party. 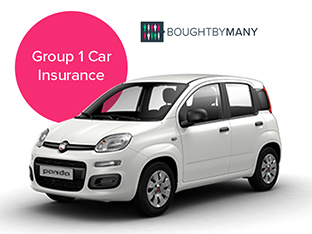 Comprehensive policies include 24-hour accident recovery, repairs guaranteed for five years when you use an approved repairer, personal accident cover, cover for personal belongings in the car, medical expenses and new for old cover on cars under 12 months old when you are the first and only registered owner. Comprehensive policyholders also benefit from Churchill’s uninsured driver promise, which protects your claim free years if you have a comprehensive policy and you’re involved in a non-fault accident with an uninsured driver. You will need to provide Churchill with the uninsured driver's registration number and the make and model of their car. Third party, fire and theft cover offers protection against damage to someone else’s vehicle or property and causing injury to another person. This level of cover will also protect you if your car is stolen or damaged by fire. Churchill also offers a number of optional extras including legal assistance, the option to protect your no claim discount if you have four or more years, and a guaranteed hire car. You can buy a separate Churchill breakdown cover policy, which it operates in partnership with Green Flag. Find out where Churchill and Green Flag came in our guide to the 13 best breakdown cover providers. Get an instant Churchill car insurance quote online. Check Churchill's policy documents for specific cover limits. For example, if your car is written off Churchill allows you to choose between a replacement, an upgrade or the money. However, you have to have a comprehensive policy and the service excludes theft claims and your car has to be at least £3,500. Churchill states this offer is subject to availability and an exact match on the replacement may not be available but you can get an upgrade if you pay the difference. Churchill provided one of the most competitive quotes for Tesla car insurance when we researched the topic in August 2016. Its cover is underwritten by U K Insurance Limited. How much does Churchill car insurance cost? The cost of car insurance from Churchill will depend on a variety of factors, including your address, age, level of cover chosen and the model of your vehicle. However, the company does offer a range of discounts to help bring the cost of car insurance down, such as its no claims bonus. Its website says it also offers a multi-car discount for up to 10 cars in a household. This is an introductory discount and is subject to minimum premiums. You can get a Churchill car insurance quote here. What do Churchill car insurance reviews from customers say? Churchill has an average score of 3.89 out of 5 from over 540 reviews on Reviews.co.uk. In spring 2018, Fairer Finance gave Churchill a customer experience of 59%, ranking it 12th out of 52 companies. This gave it a silver ribbon. What do Churchill car insurance reviews from the experts say? Independent review site Fairer Finance rates the cover levels and features of Churchill car insurance as 4 stars out of 5. Churchill car insurance is rated as 5 Star by independent financial review service Defaqto. A 5 Star rated policy is "an excellent product with a comprehensive range of features and benefits". "Just done my pair and saved a fortune (50 a month). Thank you so much. One very happy dogue owner here :)"
Then follow this link to get a quote from Churchill. Check out our list of the top 10 top car insurance companies. Find out who are the 13 best breakdown cover providers.